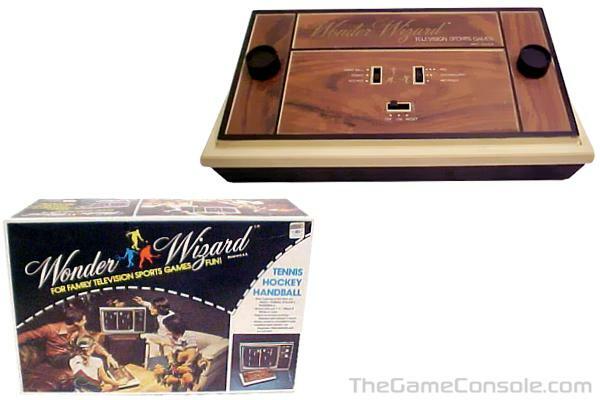 The Wonder Wizard Model 7702 was sold in 1976 and contains a Magnavox Odyssey 300 circuit board housed into a derivate of the 1972 Odyssey case. The bottom part of the case is identical, only the top differs and was made in two versions: one with silver knobs and woodgrain only in the section containing the "Wonder Wizard" name, and one (as pictured) with black knobs and woodgrain everywhere. Like Odyssey 300, this system used a 3-position switch to choose one of three predefined combinations of difficulties, avoiding the need to change the ball speed, ball angle and bat size separately. Few systems used this design and most others used individual skill level switches.